NEW YORK (Reuters) - New Yorkers by a wide margin approve of plans for Amazon.com Inc to build a massive new campus in the city, although they are divided over terms of a multibillion-dollar incentive package used to lure the largest U.S. online retailer, according to poll results released on Wednesday. 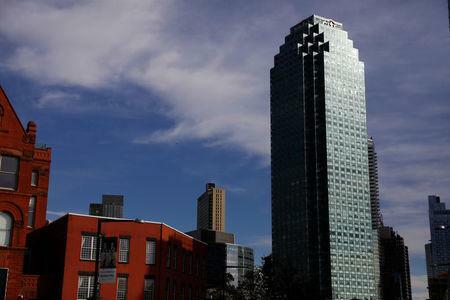 Fifty-seven percent of New York City residents who responded to the poll approved of Amazon building one of two secondary headquarters in the Long Island City area of Queens, more than double the 26 percent who said they oppose the move, according to a Quinnipiac University poll. Respondents were divided on the $2.8 billion in tax breaks and incentives offered to attract Amazon, with 46 percent supporting them versus 44 percent who oppose the package, the poll found. Amazon last month announced plans to spend $5 billion on two new headquarters - one in Long Island City and one in Arlington, Virginia, outside of Washington - which the company said will each employ more than 25,000 people. Bidding for the campuses attracted hundreds of offers from states and cities in a year-long process that garnered widespread publicity for the company. Results of the poll suggest that critics of the project will have trouble derailing it. Local residents, including city and state lawmakers, have criticized arrangements that minimized the need for Amazon to obtain local approvals that would ordinarily be required of such projects. Some city councillors and state representatives have said they oppose the deal, due to the large tax breaks and potential infrastructure impact to the Queens neighborhood, as have some local residents who have turned to social media to express their concerns. Quinnipiac University surveyed 1,075 New York City registered voters for the poll, which has a margin of error of plus or minus 3.8 percentage points.